Our next two shows at The Witham in Barnard Castle are sold out (Alistair McGowan on the 24 April followed the next day by Chris Ramsey on the 25 April). However, if you see "Book Now" against the tickets on the shows then it means we have some returns so grab those while you can. This is always the site where returns are processed and the last site where tickets for the Funny Way To Be Comedy shows are held before they sell out. Our next show where we have tickets is Jayde Adams and Rich Wilson on Friday 26 April. Check out the tickets below for some of the biggest names in UK comedy such as Lost Voice Guy, Andrew Maxwell, Jan Ravens, Sophie Willan, Tom Rosenthal and Mark Watson and more soon to be announced! Subscribe to our regular email to be among the first to find out more about ticket presales, ticket discounts and returns for sold out shows. 1) On-line with a credit card (with a booking fee). Scroll up this page as tickets for shows are all in date order for tickets through Ticketsource, our prime on-line ticket partner. Or alternatively click [Tickets] on the top menu. For some shows tickets may also be made available from other partner ticketing sites such as SeeTickets, Ticketmaster and ENTS24. 2) In person at The Witham Hall (for shows at that venue), by cash or credit card, in Horsemarket in Barnard Castle. There is no booking fee for these transactions. 3) By telephone (by credit card) to The Witham box office (10am to 4pm, except Tuesdays and Sundays) on 01833 631107. There is a £0.50 booking charge for each transaction. 0333 666 3366. This line is open Mondays to Fridays, 9.00am to 7.00pm (ex bank holidays) and Saturdays 9.00am to 5.00pm. Ticketsource calls received outside of these hours will operate on an answerphone and call back facility. 5) If you are experiencing difficulty or don't have a credit card then ring our information line on 01833 650930. This line should be used for all general enquiries such as timings, going onto waiting lists, special requirements, checking on show sell outs. We send out regular newsletters which contain information about ticket availability, ticket offers, pre-sale offers and our new show announcements. We always announce details that way so if you don't want to miss out be sure to sign up. So, be among the first to hear our latest news by subscribing to our eNewsletter. Unless stated, all shows at 14+. Unfortunately anyone under this age will not be admitted and we will not be able to offer a refund due to incorrect purchase. In common with promoters and theaters across the country we are unable to offer refunds on sales unless a show is sold out. For sold out shows, at our discretion, Funny Way To Be Comedy will try to re-sell the tickets. Should we be successful we cannot refund cash, but a full credit (without deduction) will be made against future ticket purchase. We are always happy to talk so give us a ring if you have any sort of a problem. Tickets for every show are available on this web site until they are sold out. When Funny Way To Be tickets go on general release they can also be obtained at The Witham Box Office in Barnard Castle during their normal opening hours (10am to 4pm Tuesday to Saturday). 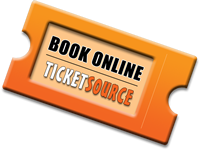 Ticket Source are our partner ticket provider. See above for more details. The Witham is centrally located in Barnard Castle in the main street, Horse Market. Access is either at the front of the building in Horse Market or at the rear from The Durham County Council (Morrison's) car park. The address for The Witham is 3 Horsemarket, Barnard Castle, Co. Durham, DL12 8LY. Barnard Castle, County Durham is situated in the heart of the Pennines in North East England. The town is just off the A66, 20 minutes by car from Scotch Corner (A1), 40 minutes from Penrith (M6), 30 minutes from Darlington and 40 minutes from Durham Tees Valley Airport. The nearest Rail Station is Darlington on the East Coast Mainline. From the A1 take the A66 westbound at Scotch Corner interchange (just south of Darlington). From the M6 follow the A66 eastbound from Penrith via Brough and Bowes. At Bowes follow the A67 into Barnard Castle (4 miles). If travelling south via the A68, stay on this road until you reach West Auckland where you take the A688 towards Barnard Castle. If travelling from Darlington take the A67 via Gainford.